Travelling in Europe alone? Here’s the best travel plans to visit offbeat places in Europe and get to know it from an adventurous point of view. Imagine old-world charm, mysterious architecture and the clash of old and new in Slovakia’s capital, Bratislava. One day in Bratislava or on a day trip and you’ll notice how the city is often brimming with unusual stories, culture and a new generation of Slovakians who are eager to shed their Communist dictatorship that once ruled this capital. Getting from Vienna to Bratislava is often a breeze and and people usually take day trips from Vienna to visit this beautiful city via a train or bus ride. Just an hour away, and straddled between Budapest and Vienna, Bratislava is often forgotten or only deemed as a quick visit. I visited Bratislava on a bicycle trip along the Danube after coming in from Vienna, and we came across the WWII bunkers close to the Austrian border with a notable mention to Bunker BS-8 which provided very moving displays of the war featuring women soldiers. This was one of the several bunkers built by Czechoslovakia in the 1930’s. After chugging down copious amounts of coffee and having a feel of the city’s cobbled-stone compact bars and cafes, I experienced how a 25-year old country managed to carve its own identity in Central Europe. It was the odd juxtaposition of skyscrapers against the old-town cobbled-streets that brought new life and quirks to the city’s landscape. Here are some of the things to do in Bratislava in one day and 24 hours if you’re on a day trip from Vienna. It is hard to miss the landmark as-plain-as-it-looks Bratislava castle overlooking the capital that was built in the 9th century. During my walking tour, our guide referred to this castle as a child’s painting because the simple silhouette in white is not overtly beautiful compared to the Viennese architecture. Despite this, the castle bears prominence and stands on an important crossroad between the ancient routes. First traces of the settlement on the hill stretch back to the Stone and Bronze Age. The place had its strategic geographical importance in the period of the Great Moravian Empire . The real charm of Bratislava is casually strolling through the old town and taking in the picturesque views while relaxing with a cup of coffee. 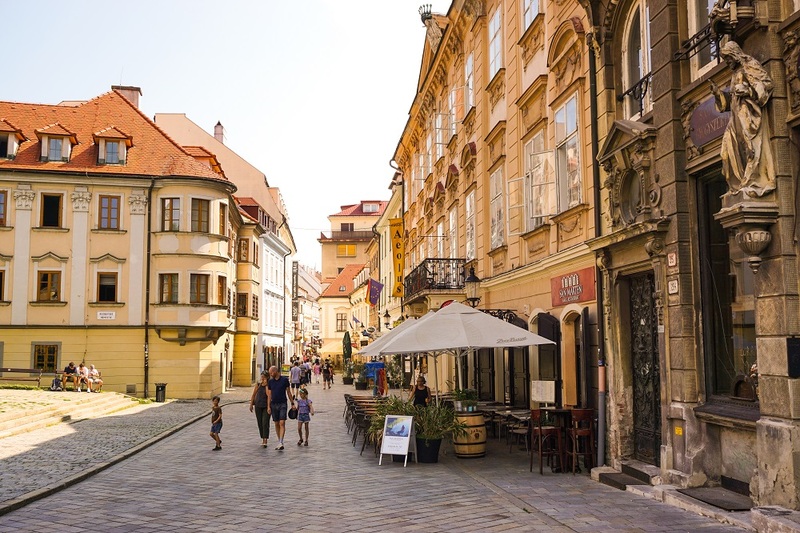 Compared to its neighbouring cities, Bratislava is unhurried and feels small and quiet and deserves that extra time to slow down, people watch and take in what you can. Some of the best cafes in Bratislava include Štúr Café, Urban House and Zeppelin Cafe. ﻿As bizarre as it sounds, word has it that the narrowest house in Europe can be found in Bratislava measuring at 130cm. In the end of 18th century, when town walls were demolished, a narrow space was created between Michael’s tower and Michael’s gate called the “zero point”. There’s a kebab shop at the bottom as well making it quite the unusual and weird sighting. Here’s a tip: perhaps it’s best to visit this place before lunch. ﻿I would say this is Bratislava’s most appealing artistic building that stands out in comparison to the block buildings surrounding it. The Church of St. Elizabeth, commonly known as Blue Church, is a Hungarian Secessionist Catholic church located in the eastern part of the Old Town in Bratislava. The church is a work of a Hungarian architect who designed it in the 20th century. ﻿We did some research prior to our visit and we found the Slovak Pub to be an impressive place brimming with history and nostalgia. 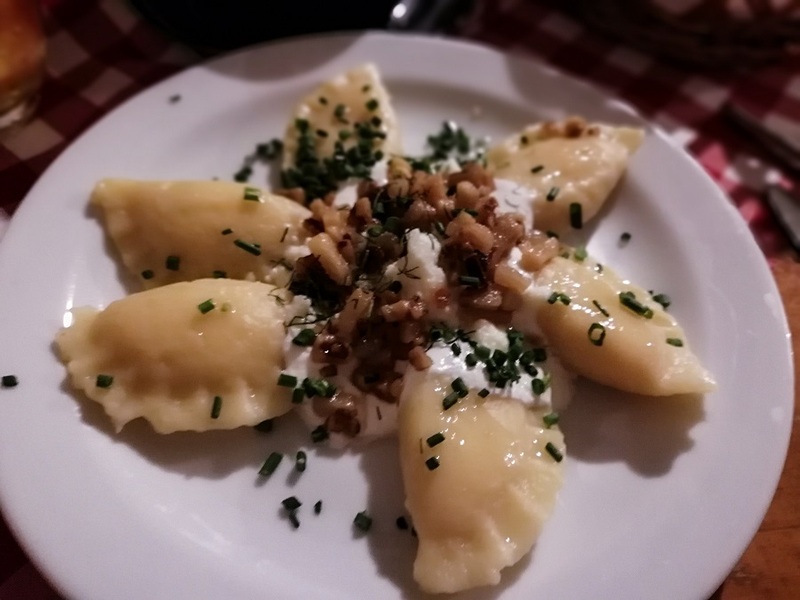 The owners have their own farm and everything is fresh and doused in local ingredients from paprika to ghoulash, chowder and their famous Bryndzové Halušky (potato dumpling with sheep cheese and bacon bits) served with some Slovak lager. 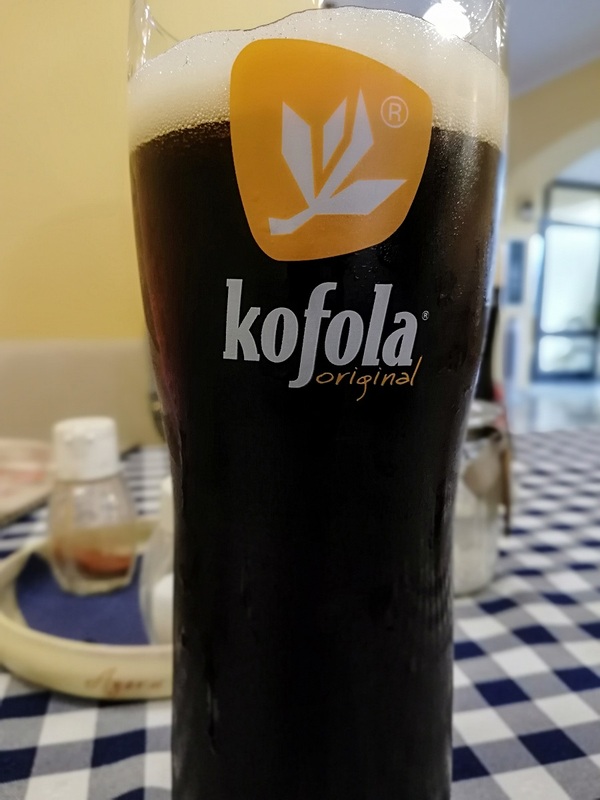 When you’re done, visit any restaurant or cafe and grab yourself a Kofola drink - a cheaper alternative to Coca-Cola that was served up during the Communist era. Pay your respects to some of Bratislava's liberators at the Slavin War Memorial, a memorial monument and burial ground dedicated to the Soviet Army soldiers killed during the liberation of Slovakia's capital in World War II. There were 6,845 Soviet soldiers who died during the battles for the city. It is a fitting memorial to the huge sacrifice that was made. To get to the Slavin War Memorial, it is a 30 minute walk from the city but if you’re not up for it, you can take the local transport such as trams or buses. When you look at the skyline, it is crazy to think there’s an alien-like UFO space ship dotting the skyline of Bratislava. It is the first thing a visitor sees if you travel by road. Over 85m high, the UFO Tower is a great piece of work by the 70s’ of the Communist times with a circular observation deck and a retro cafe serving cocktails. The entrance fee to the UFO Tower costs 8 Euros. On the other end of the spectrum, about 10km away from the main square overlooking the Moravi River, you’ll find the “Freedom Cycling Bridge” that is equivalent to Slovakia’s border with Austria that was once supposed to be called the “Chuck Norris Bridge”. The name was rejected despite 12,599 votes for the Norris name in a two-month online poll. The bridge is in memory of people killed attempting to escape communist eastern Europe, however, it baffles me why would Slovakians want to call a bridge after an action hero. Situated in Devin, the rural countryside of Bratislava lies a village that is physically separated from the city by its hills and woodlands. Not far from the old town and its medieval St Michael‘s gate lie Devin Castle’s ruins. Due to its strategic location, on a cliff over the confluence point of the Danube and Morava rivers, many battles have been fought for it. This was also the case during the Cold War era, when both rivers used to form part of the border that was the Iron Curtain. While it still border with Austria, it is now not as heavily guarded as it was previously. Over here you’ll get to see a couple of memorials which now commemorate that haunting period in which several hundred people lost their lives trying to get across to the West. You can catch the bus No. 29 headed there from the UFO Bridge. With the quaint buildings and massive gentrification, Bratislava is slowly coming out of its shell to showcase the unique eccentricities of the city and what makes it truly Slovak. If you do get the time, do visit the Petrzalka region in the south of Bratislava. The area is made up almost entirely of flats in high rise concrete blocks left over from the communist era. There are many examples of Communist architecture in Bratislava but one hot summer day trip is certainly not enough to explore them all. The cheapest way is to take a bus from Vienna to Bratislava using FlixBus, Eurolines or RegioJet, It’ll take you an hour. Take the train from Vienna to Bratislava which runs twice within an hour. You can check the schedules and prices on the OEBB website. Cycle from Vienna to Bratislava just like what I did.